I don’t often drive; I don’t even own a car. But on certain trips renting a car is the right call even if it is driving on the left side of the road. Scotland was one of those trips. hmm. it's on the other side. I decided to drive and hire a car in Glasgow since my time was short in the country and the first days were about attending a wedding (in a kilt). I knew the entire trip would be an adventure and it was. 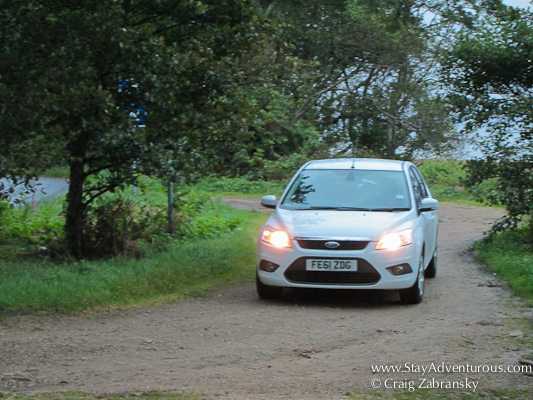 In my Ford Focus I navigated the gorgeous green countryside, boarded a ferry to an island, and cruised the capital city streets of Glasgow. Yes, driving in Scotland was indeed an adventure. It may not be the wrong side to everyone, but it certainly isn’t the right side. Driving on the left side changes everything. Add a stick shift and not only do you need to judge your special relationships with a bit more caution, but you also need to coordinate the feet differently. It’s a change, one that requires focus. Game on. 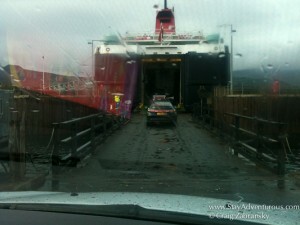 After receiving helpful and accurate directions (no GPS for me) my next stop was the Island of Arran. Yes, an island. I needed to take a ferry across the sea. But first I needed to find ferry terminal through single lane roads of the Scottish countryside. Thankfully the countless roundabouts en route were well marked and rather large. Not nearly as impossible as I first thought. The challenge became passing an oncoming car and passing it when the road curved. Yikes. But after each pass, I started to enjoy the road. No surprise much of my drive occurred with a grey sky and various forms of rain that tested my ability to find the proper windshield wiper speed, but when the sun did shine, the views delighted. The rolling green hills, sheep, cattle and eventually a wind farm did delight. Upon approaching the ferry terminal, it was debatable if the ferry would cross. That afternoon the weather and winds were at caution yellow. There was a chance I’d be spending the night in Ardrossan (the mainland). But when the ship came to port, I enthusiastically asked the ticket collector if the weather improved and if we’d make passage. He simply replied, “No, it hasn’t, but she’ll still go.” Not the confidence I hoped, but I knew I wasn’t driving this part of the journey; I just needed to park it tightly on the ship. I did. And then actually having a car on the island was the best call. The one main circular road provides opportunities to visit the Arran Brewery, Arran Aromatics, Arran Adventures and more. Countless cute towns and seaside views are worth a stop too. I even attempted to capture a sunset one evening. The island and Scotland are so beautiful when Mother Nature allows you to see a glimpse of her. 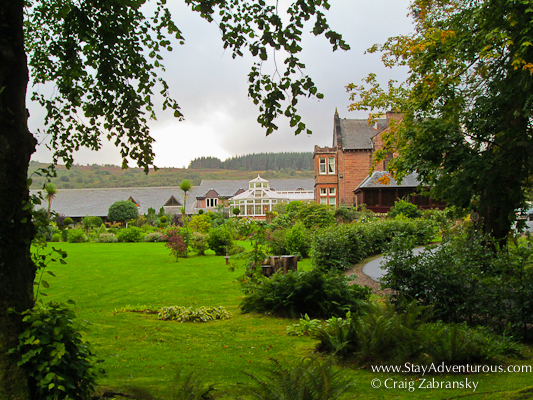 After a few days exploring the Isle of Arran, I returned and traveled to Glasgow. Back across the ferry and then off to the city. After a return through the countryside next up was entrance to the highway to the city and traffic. Highway traffic and multiple lanes were a change and a new experience from the left side, but it was the hills of Glasgow I’d remember most. In a standard shift you should fear them. But it is good in life to conquer your fears. 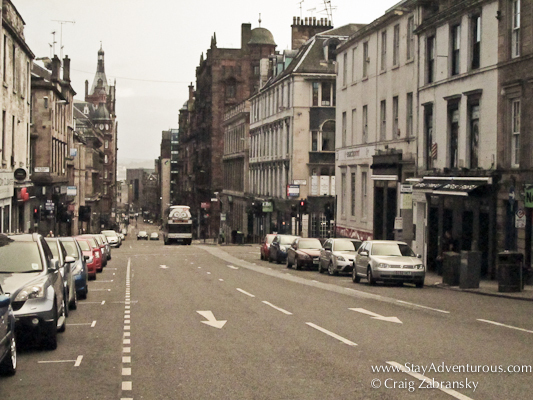 I am glad Glasgow turned out to be a walkable city from my centre city hotel. People might not consider it as adventurous as renting a car in Mexico, but after my recent adventure I beg to differ. It truly was an adventure in itself. I am not advocating renting a car just to drive on the “other-side” of the road. No. I am advocating trying something that requires concentration and focus. And to try something new. Sure, driving might be part of a boring routine for many, but when you travel new roads, see a new gorgeous countryside, take a ferry, and set out to explore – that’s adventure. I’d like to thank ArgusCarHire for assisting me with my rental from Alamo. I enjoyed my time in the Ford Focus. But as always, the opinions and adventures were my own. I forget as a New Yorker you don’t drive much. This post had misadventure written all over it. When I rented a car in New Zealand and Ireland (both left-side driving) I forked over the extra money for an automatic. It was totally worth it! Oh, and I also took my car from the North to the South Island on a ferry…talk about making me nervous. Sounds like you made out ok…just like I did. boarding and exiting the ferry were probably two of the tougher moments of the adventure… and with single malt scotch specials on the passage, it even hurt more as I could not just belly-up at the bar. I might rent one in the countryside but I much prefer public transportation – especially on the other side of the road. I think I would freak out a little. I had to get used to crossing the street in Ireland and that was hard enough. I don’t think I would want to drive although the countryside would be a lot of fun! Oh, I’ve always wanted to drive on the opposite side of the road. I have yet to make it to Europe, but I will definitely be renting a car whenever I make it there. The countryside is stunning. I can’t wait to see Scotland! I often wonder what it would be like to drive on the left and how long it would take me to get used to it. This post certainly brings me closer to the answer, but I know that one day I’ll have to try for myself… But, I haven’t driven stick shift for years and I’m not sure I’d like to again. Nuh uh. You certainly stayed adventurous on this trip! I don’t know how to drive stick shift so I wonder if the Glasgowians would appreciate me being adventurous on their streets! ahh takes us back to driving across the irish countryside. would love to do the same in scotland! Ah, a story about me in me kilt will be up soon…. a true Scot? why that always is the conversation isn’t it… even when you have it on – people want to know. I always say, when in Rome, do what the Romans do, so when in Scotland ….